This light and creamy one-pot carrot orzo gets it’s creaminess from veggie broth and parmesan (no cream!) and is a delicious vegetarian side dish to serve with dinner tonight! I’m a big fan of doing a full fridge clean-out before traveling. It ensures nothing perishable goes to waste, and often results in some of my most simple, speedy, and creative recipes! Normally if the only veggie left in my crisper drawer is carrots, I opt for roasting them. This time, I managed to score an onion and some garlic from the pantry, plus a few other shelf-stable essentials, and create the most delicious Spring side dish! The ingredients for this easy peasy one-pot carrot orzo are things we almost always have on hand. Can I gush for a second? This creamy (cream-free!) orzo is SO FLIPPING GOOD. I’m beyond excited for you to try it! This bad boy is for sure going to be on the menu again for Easter weekend and has already earned itself a place in “what-on-earth-are-we-making-for-dinner? !” side dish rotation. The leftovers are phenomenal, so get excited if you have some left over for lunch the following day! This light and creamy one-pot carrot orzo gets it's creaminess from veggie broth and parmesan (no cream!) and is a delicious vegetarian side dish to serve with dinner tonight! Spread shredded carrots onto a cutting board and chop into small pieces. If using whole carrots, simply grate using a box grater and chop, or feel free use a food processor. Heat a 4-quart pot to medium heat and melt your butter. Add onion and carrot and cook for 5-8 minutes, stirring occasionally, until tender. While your veggies cook, microwave broth and water for 5 minutes in a large glass measuring cup or microwave safe bowl. If preferred you can heat via a small pot/saucepan on the stove. Add garlic and orzo to your onion/carrots and cook for an additional minute. Slowly stir in hot broth mixture and season with salt, pepper, and thyme. Keeping heat set to medium, cook 15-18 minutes, stirring frequently to prevent sticking, until the liquid is absorbed and the orzo and veggies resemble a creamy risotto in texture. Mixture will be quite liquidly but the veggies and orzo will soak up the broth as it cools. Add parmesan cheese and chives and mix well. Add any additional salt, pepper, and parmesan to taste if desired. Remove from heat and serve while still hot. Peel carrots and remove the ends. Slice thinly. Heat a pan or skillet to medium-high heat and melt butter. Once butter starts to bubble, add carrots and leave in a single layer, undisturbed, for approx. 3 minutes. Once they've seared and started to caramelize a bit, they'll release easily. Flip and cook the other side for 2 minutes or so or until carrots are tender, stirring as needed to prevent over-browning. Season with salt and pepper to taste and sprinkle with parsley for an optional garnish. 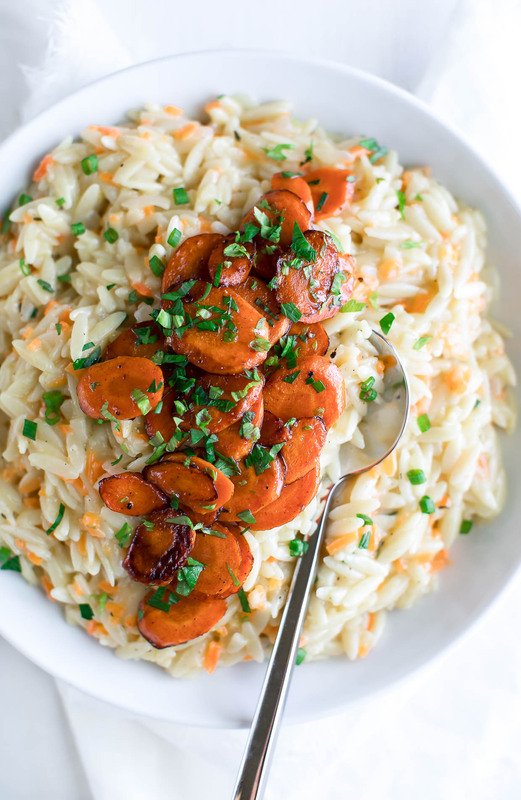 Serve atop carrot orzo for a burst of color and extra carrot flavor! 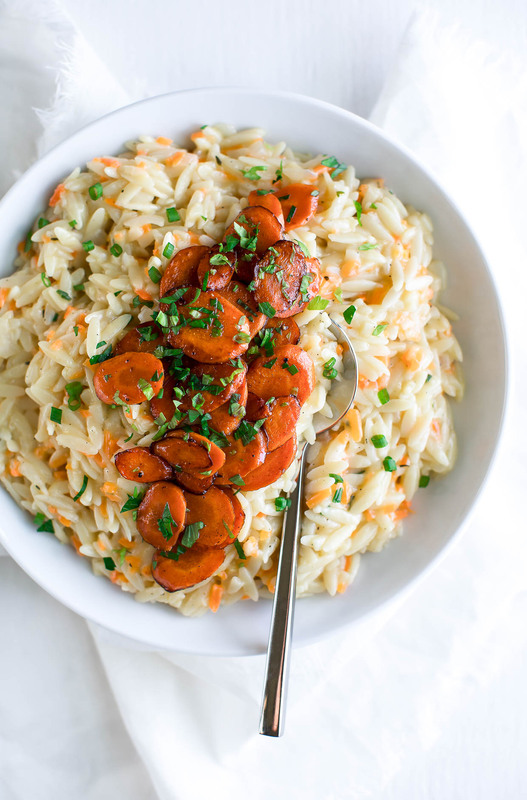 If you get a chance to try this easy peasy one-pot carrot orzo recipe, let me know! Leave some love in the comment form below or tag your photos with @peasandcrayons on Instagram so I can happy dance over your creation! I can’t wait to see what you whip up! 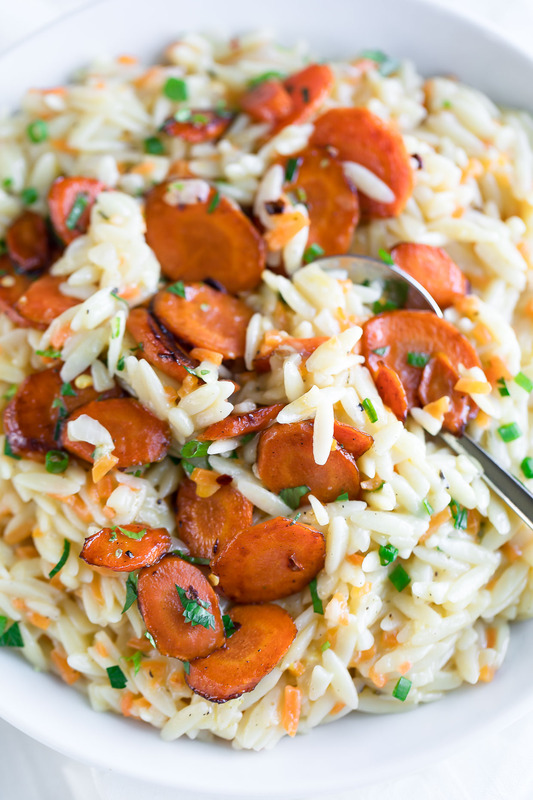 I love orzo and I cannot wait to try this carrot version! I think I’ll make it with dinner tonight! 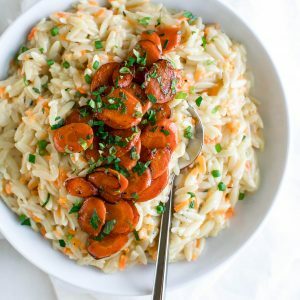 The combination of carrots and orzo is outstanding. Definite yes for Easter this year. Thank you. 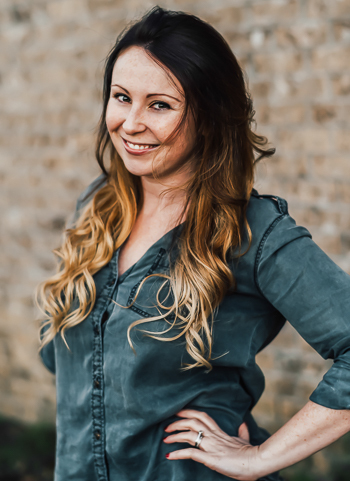 So stoked you’re loving it Marjory – thanks!